From centre left to right : Mr David Cheong;General Manager, Nu Skin Malaysia & Brunei and Mr Hendrix Wong;Vice President, Sales & Marketing, Nu Skin Malaysia with ageLOC Me device. Hey, pretty! Tell me honestly, how many bottles of skin care you have on your dressing table? What is your primary skin concern? Hydrating? Whitening? Or firming? 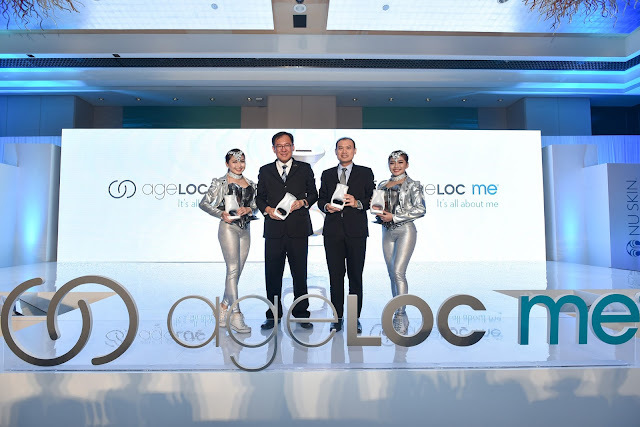 Nu Skin Malaysia has launched its revolutionary ageLOC Me, a unique anti-aging skin care system equipped with state-of-the-art technology and breakthrough anti-aging formulations. Uniquely personal, the ageLOC Me redefines daily skin care regime by catering to the individual’s distinctive needs. 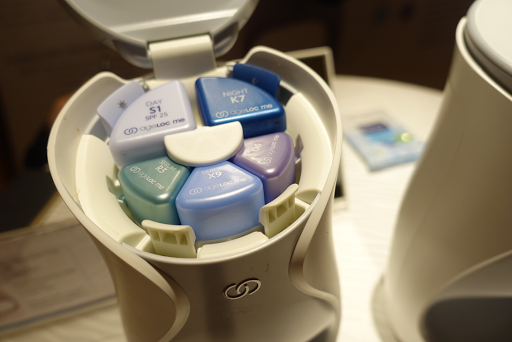 Created by world’s premier anti-aging specialists, ageLOC Me is a simple to use, home beauty device that delivers customized regimen of powerful anti-aging moisturizers and serums from almost 2,000 possible regimen combinations formulated for both men and women who are concerned with preventing and minimizing the signs of aging. The system also features five powerful anti-aging products in one smart, hygienic device, making skin care routine fun and easy by providing one streamlined, simplified regimen to you in a precise dosage for daily morning and night usage. The ageLOC Me device includes these smart product delivery modes, including semi-automatic, automatic, travel and single use mode in 29 languages to help users with their experience. 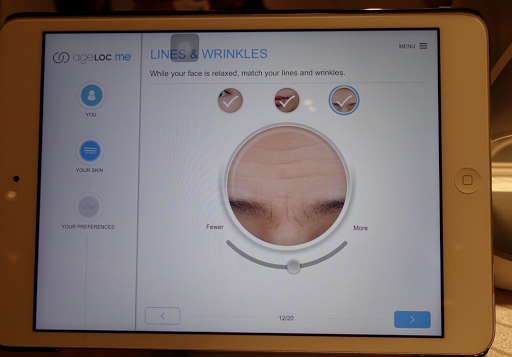 Begin with a baseline set of moisturizers and serums for two weeks, the next step is to complete the ageLOC Me digital assessment to determine product set customization based on individual skin care needs and preference, from which a personal skin care code will be obtained. Users can take the assessment repeatedly to ensure skin care regime is renewed from time to time according to their current skin conditions. · ageLOC Me Serums (3)—Maximize anti-aging treatment with the power of three to improve the visible signs of aging—lines and wrinkles, uneven skin tone and rough, dull skin—resulting in noticeably healthier, younger looking skin. · ageLOC Me Day Moisturizer—A refreshing way to begin the morning, Day Moisturizer provides hydration to strengthen and maintain the skin’s natural moisture barrier, helping protect throughout the day. · ageLOC Me Night Moisturizer—Specifically formulated to rejuvenate as you sleep, Night Moisturizer calms and soothes the skin while aiding the natural night time recovery process. Guest speaker Dato' Dr Rajbans Singh shared about human skin gene expression. Three pairs of twins of different age group flaunt the stage with their unique codes derived from the ageLOC Me digital skin assessment. 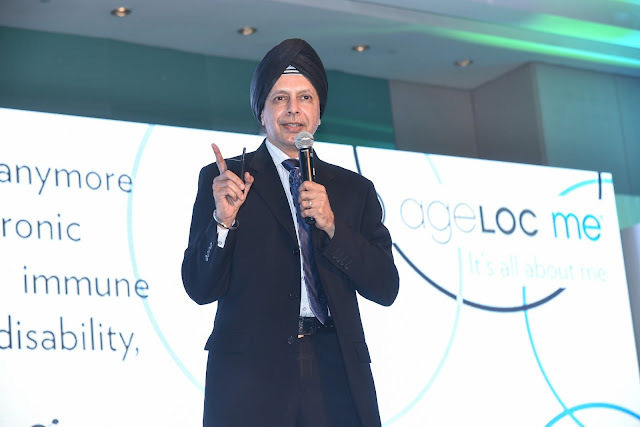 Each individual has distinct skin conditions and preferences hence with ageLOC everyone could get a customised anti-aging skin-care regime catered to their respective needs. Nu Skin ageLOC Me Skin Care System is available at all Nu Skin Distribution Centers, retailing at RM3,346. For more information on Nu Skin, please visit www.nuskin.com or follow Nu Skin’s Facebook page, or feel free to contact the hotline: +603 – 2170 7888.